Imagine the flu is spreading across a small community. One person decides to go to work, even though she’s feeling sick. Another decides to stay home in bed. How do their behaviors affect not only their own lives, but also the lives of everyone around them? Bert Baumgaertner, an assistant professor of philosophy at the University of Idaho, is designing computer simulations to answer such questions. 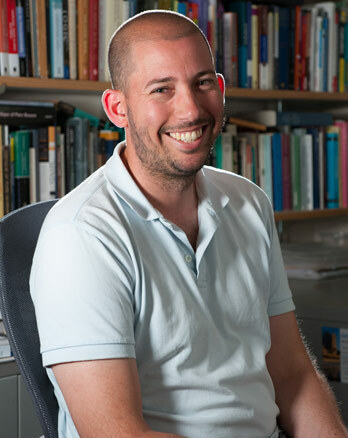 Baumgaertner works with agent-based models, which philosophers and other researchers use to study how individual decisions lead to larger patterns across a community. His project is among the first funded through UI’s new Center for Modeling Complex Interactions, which was established by a $10.6 million National Institutes of Health grant. The decision-making involved in disease is far more complicated than a simple “should I stay home, or go to work?” People’s beliefs about a disease affect their behavior, as do social norms. Decisions can have ripple effects, and changes in the community can oscillate back and alter individual choices. “Normal interaction can change in response to my knowledge of an epidemic or how something is actually spreading,” Baumgaertner says. Much of Baumgaertner’s research is theoretical — figuring out how to structure a model that can incorporate all the variability involved in epidemic scenarios. While similar computer simulations are used in philosophy, economics and epidemiology, Baumgaertner is examining how to bring aspects of these models together. The resulting models could help answer real-world questions. For example, Baumgaertner is working with Michelle Wiest, an associate professor of statistical science at UI who is studying the role of cultural practices in the recent Ebola epidemic. When people self-report about their behaviors during an epidemic, they may not always tell the truth. For instance, people may tell outside interviewers that they are not following traditional burial practices that could spread disease, but privately continue doing so. Combining empirical data about disease spread with agent-based models could help reveal what behaviors are actually in play. Such models could also help doctors, public health agencies and others decide how to best use their limited resources to reduce risk — targeting individual behaviors that will have the largest effects across the community. “Resources in the wrong place can make a problem worse,” Baumgaertner says. In addition to working with Wiest, Baumgaertner is collaborating with assistant research professors Ben Ridenhour and Craig Miller in biological sciences and mathematics professor Steve Krone, as well as using his research to support other Center for Modeling Complex Interactions projects. Baumgaertner is excited to work on research that doesn’t just cross traditional disciplines, but transcends them.